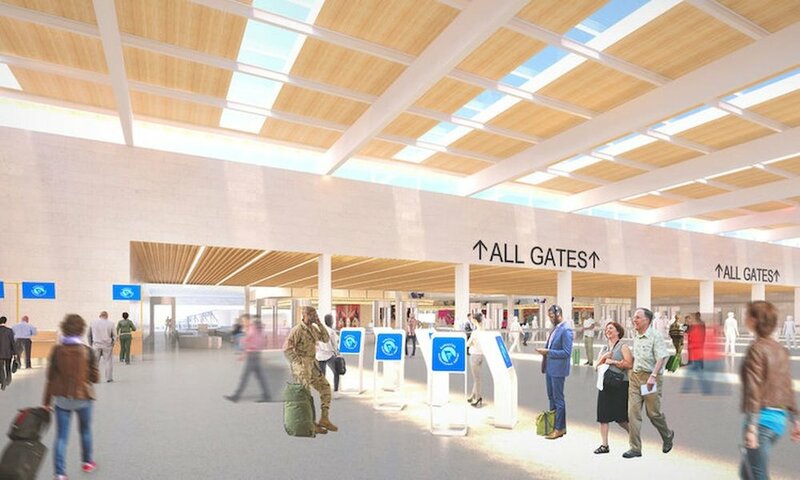 An artist rendering shows what the check-in area of the new KCI single terminal project could look like. Six of the eight airlines agreed on the cost of $1.5 billion recently. Despite clearing a big hurdle, the start of a new KCI single-terminal airport construction is still has a ways to go. During an airport committee meeting on Thursday, Feb. 7, Southwest Airline’s Steve Sisneros told the members that six of the eight airlines that use KCI have reached an agreement to develop the new airport at a cost of $1.5 billion. That is drop a from the most recent known number of $1.64 billion but all parties involved made sure those in attendance — and those watching on Channel 2 — knew the scope of the project hasn’t changed. Rather, the lower price was achieved by finishing design work with the new price guideline. Late last year, Frontier Airline and Spirit Airline stressed their displeasure in the cost of the airport, which at one point peaked at $1.9 billion. This marked some substantial progress for a project that was approved by voters in November 2016. Until the airlines could come to an agreement on the cost, significant work and design was at a standstill. Sisneros noted Southwest has been involved with numerous airport projects across the country and noted the belief of the majority of the airlines at KCI this project could be achieved at $1.5 billon. The actual number could vary due to circumstances, but Sisneros and Edgemoor’s Geoff Stricker noted they are in all agreement to hit the $1.5 billion number. There is still no date for actual work on the project, most notably the demolition of terminal A, which could be on the horizon. The estimate is a four-year construction frame and up to 5,000 people could have some working role in the construction. An environmental study approval is still needed. Councilman Quinton Lucas said he has a shovel ready to go to break ground, while councilman Dan Fowler, who represents Platte County in the second district, joked he had a pick axe, because a shovel wouldn’t get terminal A torn down. Director of Aviation Pat Klein noted the city may look at short-term financing to get the demolition underway. Sisneros noted bonding for airlines typically go in session in terms of construction, which drew the ire of some council members who were there. “If we are going to celebrate a deal, I want to celebrate the whole deal,” said councilman Scott Wagner, who questioned what the actual cost would be after financing. Heather Hall, a first district councilwoman, also could be added to the skeptical column. Stricker was asked why Edgemoor couldn’t front more of the cost to get the project started, but noted the company has covered the design cost for the past year, before noting he works for a construction and development company, not a bank. The council formally approved going forward with the airport project on Feb. 8, 2018. A signed agreement from the airlines is expected to go before the council on Feb. 25 with a nine-year deal. Klein stressed some airlines won’t sign, such as Frontier, which doesn’t sign any deal longer than five years. Platte County’s other representative, Teresa Loar — second district at-large — asked a question that many in the metro are asking. Why did it take so long? Sisneros noted the timeline in Kansas City has been pretty normal compared to other projects trying to turn airports built 40 or 50 years ago into one that adapts to the current society wants and needs. “These are hard things to do and make sure we get it right the first time,” Sisneros said. United Airlines will have an additional nonstop flight from Kansas City to Newark, N.J. Starting March 19, the airlines will have four daily flights instead of three from KCI Airport. The additional flight will leave at 1:30 p.m. and arrive at 5:48 p.m.